**NEW** A new version of Sharegate is available for you to download. Get the latest version here. You can also view its always improving list of migration & management features. Today is an epic day for the Simplest Migration Tool. Sharegate has been released and with it, the SharePoint Sites Migration. This has been in the works for some time here with the Sharegate team. Our goal was to release a solid version while keeping our promise to be the Simplest Migration Tool to use. I believe we have delivered on that promise. This Desktop tool even migrates Sites to Office 365! We modified the interface you love from the Copy Site Objects feature and introduced two new navigation items: Current Site and Subsites. Copy the current site you are connected to, this could be the root site of a Site Collection for example. When copying the current site to the destination, besides all the usual Copy Site options, you will also have the option to copy as a subsite or merge with the destination site selected. The merge will add any missing site objects at the destination or update existing ones. As easy as drag and drop, select one or multiple subsites you wish to copy and hit the Copy Button. Sharegate will prompt you with options to make your SharePoint site migration. A migration is the opportune time to rethink your SharePoint architecture. Database-Attach upgrade is nice but it brings along all the old junk you had in the past versions. Take advantage of Sharegate's Site migration to choose how and what to bring over to your brand new shiny SharePoint destination. 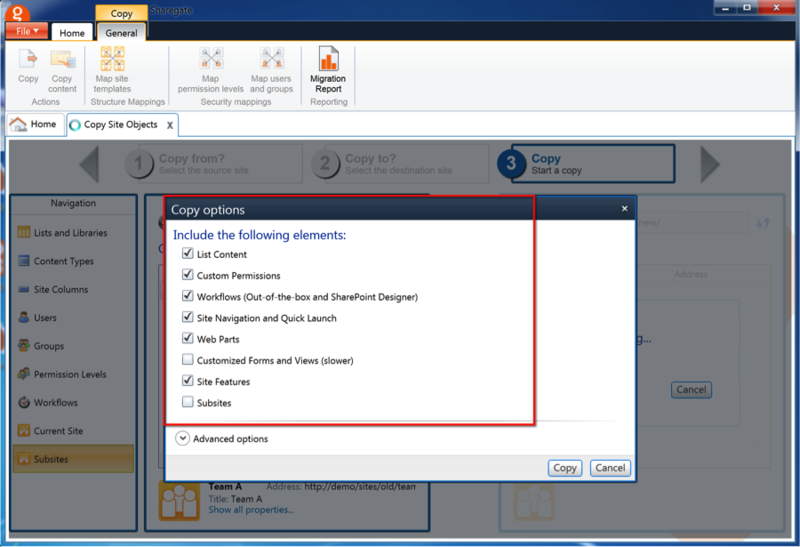 List Content: Will not only copy SharePoint lists and libraries with their settings but will also copy their content. Custom Permissions: Will maintain any unique permissions set at the source of the site and site objects like lists and libraries. Workflows: With this option on, Sharegate will migrate all your Site Workflows, Content Type Workflows and any list or library Workflows created with SharePoint Designer or the out-of-the-box available Workflows. Site Navigation and Quick Launch: Maintain the exact same navigation settings for your site while you migrate. Sharegate will take care of the URLs so that you dont have to worry about it. Web Parts: This one is so big it has its own section in the release notes with more details. Keep your Web Parts when migrating, even from SharePoint 2003! Customized Forms and Views: If you customized your forms or views with SharePoint Designer for example, Sharegate will take care of bringing it over for you. Site Features: With this on, you wont have to worry about activating the features you need to make things work in your new SharePoint site. If you had it working before, Sharegate will make sure itll still be working then. Subsites: What if the SharePoint Site you are copying also has multiple subsites? Turn this on to bring along all of these subsites during the migration. And of course the same Advanced options are still there to help you choose what to do with the dependencies such as Content Types or Site Columns. A major differentiator in Sharegate from the others is its easy mapping feature. We kept the same concept here but instead applied it to the mapping of Site Templates. 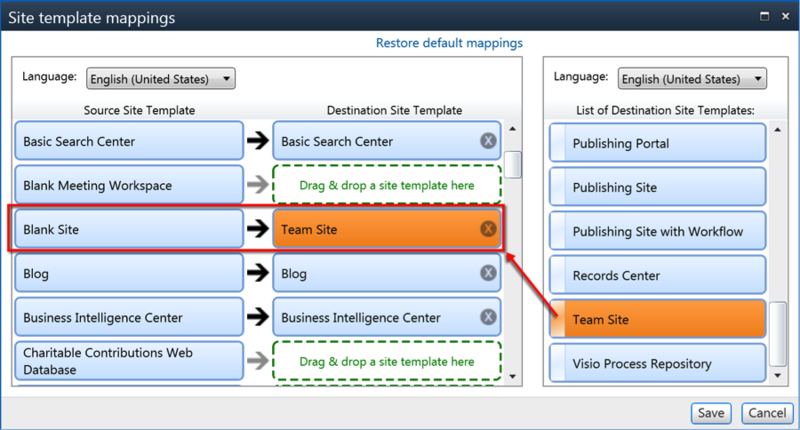 You can now turn Blank Sites into Team Sites during the migration. Pretty cool huh! This one we are very proud of, migrate your pages and keep the Web Parts that were on them! This will be of big help to those on SharePoint 2003 or 2007 and do not have a direct path to upgrade to SharePoint 2013 or Office 365. Also available in Sharegate Lite: We decided to add this feature in multiple places of our tool. Whether you are using Sharegate to migrate Lists/Libraries and Sites or using Sharegate Lite to migrate Wiki and Publishing Pages, you will now be able to keep the Web Parts on these Pages. 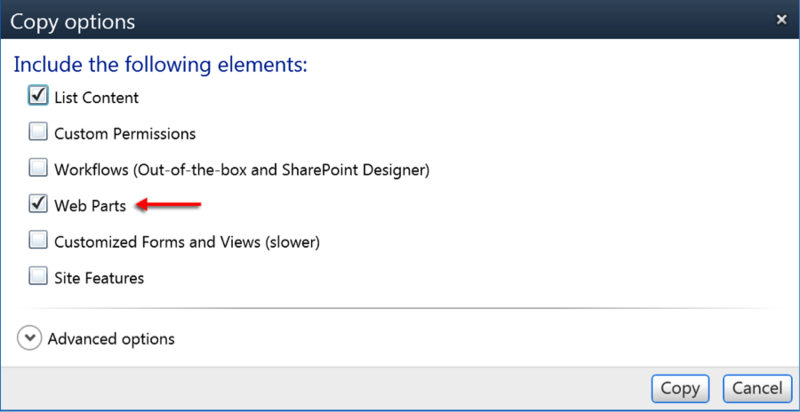 Even better news, the Copy of SharePoint Web Parts on Pages also works on the Document Sets Welcome Pages. For those that leveraged Document Sets in SharePoint 2010 or 2013, you can now successfully migrate them with their custom welcome page without a worry. And as always, weve made some minor adjustments to the interface to make sure it stays as simple to use as possible. Sharegate can now migrate your Site or entire Site Collection to a new destination straight from your desktop. This is simply pure awesomeness.